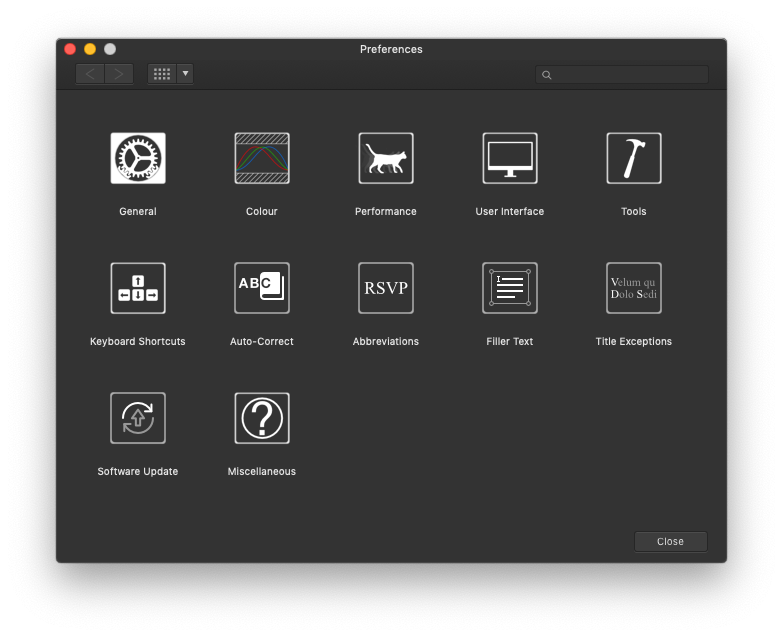 In the recent mac builds of Affinity Publisher beta ( builds 1.7.0.133 and 1.7.0.139) we have introduced an auto-update technology that we are expecting to roll out across the 1.7.0 release builds of the Affinity range. We are in the process of testing it thoroughly and as part of the process to check it works for all our customers we have created a new build 1.7.0.140 and made (small download size) updates to this build. 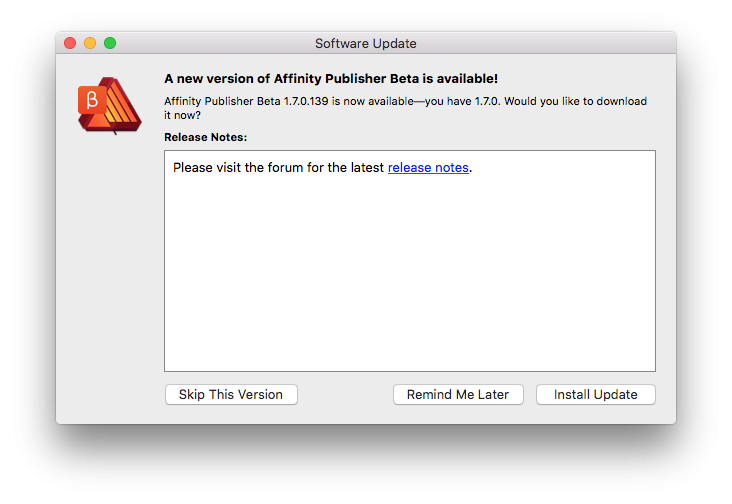 If you are running the Mac build of the Affinity Publisher Beta we would really appreciate you updating from 1.7.0.133 or 1.7.0.139 to this new build 1.7.0.140. Build 1.7.0.140 (deliberately) has no fixes and no new features over 1.7.0.139, it's just a higher version number solely to test auto-update. Therefore it has the same fixes as 1.7.0.139 over 1.7.0.133, but it gives us a chance to test updating from 2 different start points to a destination that is only available through auto-update. After updating to 1.7.0.140 please reporting here on your experience, good or bad. The update process is relatively straight forward but below is a quick guide to the app’s new update process which can be referred to. When you launch the app, if an internet connection is available, it will automatically check if there are any later versions available and prompt you to update. To begin the downloading and installation of this update click on the "Install Update" button. If you do not wish to update at that particular moment click on “Remind Me Later” to dismiss this and then you can manual check for the update at a later time (see Manually check for updates). If you have the welcome screen open the progress bar may appear behind it. Once the update has been downloaded and extracted you will be prompted to "Install and Relaunch". Clicking this button will close the app (so make sure you have anything you are working on saved) and install the update. Once installed it will relaunch the app. If you chose "Remind me later" you can instead manually ask the app to check if there are any updates available. 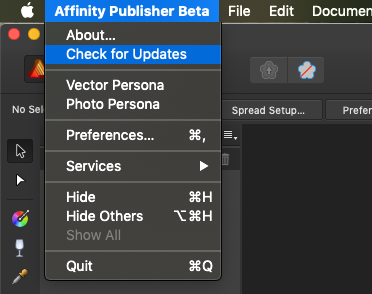 To do this go to the Affinity Publisher Beta menu and select check for updates. By default the auto-update process is set to check for updates on a daily basis. The frequency of this check can be changed in the app’s preferences.  To change the frequency go to Affinity Publisher beta menu > Preferences. From there you should see an option for Auto-Update. in app update? yes, thank you! Great thing! Works perfectly on my machine. Working fine here as well. Auto update works fine for me. Great feature. Is there a way I can just download it just once as I have it installed on two computers as my internet is slow. I use to before just copy my download one over to my other computer. If you already have 1.7.0.133 on both (mac) computers then this small update to 1.7.0.140 will be much smaller than downloading the whole of 1.7.0.139 or 1.7.0.140 once. If you already have 1.7.0.139 then you can just ignore the 1.7.0.140 build altogether (just press "Skip this Version") when prompted. If neither of these scenarios suits you just download the whole of 1.7.0.139 from here, and Skip the update to 1.7.0.140 as it's only purpose is update testing. Clean as a whistle! Just opened an "Open Recent" file. Neat as a pin. This was really missing. I hope this feature will also be added to the rest of the product line (not yet in Affinity Designer). This was really missing. I hope this feature will also be added to the rest of the product line (not yet in Affinity Designer)﻿. Thanks, that is the idea. If you have the Mac App Store version then it already does this. Are you talking about Affinity Designer on Windows or from the Affinity Store directly? That works effortlessly … but when I buy my license from the Mac App Store, I will never need this, will I? I also wonder why it said “Extracting update …” in the first place. Shouldn’t it “download” the update first? Smooth update from 139 to 140 for me. Automatic re-launch to the exact same state as before. Nice. when I click on the install update, nothing happens. not progress bar appears. Never mind, it finally appeared. Worked like a charm going from 139 to 140.
work without any problems. Must say that extracting seemed to take quite some time. Worked fine and pretty fast.